Today, the Business Call to Action and the Private Sector Innovation Programme for Health (PSP4H) co-hosted an event to discuss how companies providing health care to low income Kenyans are leveraging mobile technology and to launch the BCTA funded publication, ‘Advancing Bottom of the Pyramid (BoP) Access to Health Care: A Case Study on Mobile Money Platforms’. The event brought together leaders from private sector companies, government, bilateral donors, civil society and the United Nations. Dr. Izak Odongo made the opening remarks on behalf of the Cabinet Secretary for Health Hon. 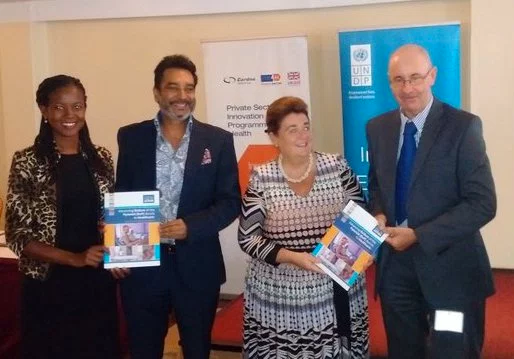 Dr Cleopa Mailu and launched the report together with Ms Maria- Threase Keating, Country Director UNDP Kenya and Mr. Tony Gardner, Deputy Head, Department for International Development (DFID). Mobile money technology in Kenya has experienced an unprecedented uptake and growth in the last few years. Research has shown that more than half of Kenya’s population earning less than US$2.50 per day (Kshs 250) have access to a mobile phone. As at September 2015, the country had 28.7 million mobile money transfer subscriptions and over US$ 26.8 million (Kshs 2.7 billion) was transacted through mobile money platforms in 2014 – a figure that represents about 43% of the country’s GDP. care financing opportunities for consumers, especially those at the Bottom of the Pyramid (BoP)1. Several initiatives in Kenya that leverage mobile money to increase access to health care to the BoP have largely been pilots that are just beginning to scale up into sustainable and commercially viable enterprises. Business Call to Action (BCtA) commissioned the report that was launched today in order to investigate the extent to which mobile money platforms are providing a means to scale up inclusive business models and access to health care to people at the BoP. It explores the challenges and opportunities to further scale up access to health care to people at the BoP through inclusive businesses that leverage on mobile money platforms. Today’s event offered an opportunity for private sector companies profiled in the report to showcase their innovative work, share learning and discuss the opportunities for scaling up the new business models which include using mobile technology for payment for health care, health voucher systems, mobile money based savings and insurance products. Participating companies included MicroEnsure, Pharmaccess, Jacaranda Health and Changamka MicroHealth Ltd.
With funding from UKaid, PSP4H has been researching how the for-profit private sector can sustainably deliver quality, affordable healthcare services to the working poor. Using a market systems approach known as Making Markets Work for the Poor (M4P), the aim is to strengthen the for-profit health sector’s capacity to reach the poor, then conduct research to assess if consumers get improved value for the money (VfM) they spend on health in the private sector when accessing that care. Jawabu Empowerment Ltd, a beneficiary of technical assistance from PSP4H, showcased their work at today’s event. Their health insurance product Afya Poa, targets the Jua Kali sector and uses a mobile platform to enable premiums to be paid on a daily basis. The product is a combination of health insurance and health savings accounts (HSAs). The health insurance covers both inpatient and outpatient needs for the whole family. Part of the premium is set aside in a HSA to be accessed by the member whenever seeking outpatient treatment. 1 The BoP is defined as the population of people living on less than US$8.4 per day. The Business Call to Action (BCtA) is a global joint advocacy platform providing public recognition for the private sector’s contribution to development. BCtA’s mission is to challenge companies to advance core business activities that are inclusive of low-income populations and thus contribute to the achievement of sustainable development goals. The Business Call to Action is a unique multilateral alliance between key donor governments including the Dutch Ministry of Foreign Affairs, the Ministry for Foreign Affairs of Finland, the Swedish International Development Cooperation Agency, the UK Department for International Development, the US Agency for International Development, and the United Nations Development Programme — which hosts the secretariat — in collaboration with leading global institutions, such as the United Nations Global Compact, Inter-American Development Bank’s Opportunities for the Majority Initiative, and the World Bank’s International Finance Corporation. The Private Sector Innovation Programme for Health (PSP4H) is a three-year programme funded by the United Kingdom’s Department for International Development (DFID) and implemented by a consortium led by Cardno Emerging Markets Ltd mandated to conduct action research and explore a new area for DFID Kenya, namely the markets in which poor people pay for-profit providers and shop-keepers for healthcare. The overall objective of the PSP4H programme is to learn lessons of how a market systems approach might benefit pro-poor health interventions. The primary target group for the project is the ‘working poor’, who have some disposable income and usually make out-of- pocket payments for health care. PSP4H encourages the private sector to invest in providing health care products and services to this target group. The programme partners with the private sector to identify innovative approaches and pilot them; if they are successful and viable, they will be replicated and scaled up. The programme helps mitigate the risk of innovation for investors. Lessons learned and knowledge gained will be documented and shared. For more information, please visit www.psp4h.com; www.businesscalltoaction.org or follow us on twitter at @psp4h or @BCtAInitiative.